This is not the Freddie Hubbard of the early Blue Note years but this was the late sixties and early seventies when jazz was in the doldrums and was not selling records in any quantity. Along came Creed Taylor who was a producer and A & R man who had a plan to revive the music, he signed a number of jazz musicians and devised a different approach which involved electrics and a strong backbeat which had more in common with rock music than jazz. 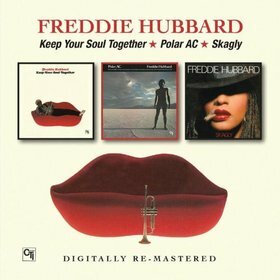 All four compositions on the first album “Keep your soul together” are by Freddie Hubbard and three of them have a monotonous dirge like quality which does not lend itself to a jazz feeling. “Spirits of Trane” has some of the old Freddie Hubbard fire and drummer Ralph Penland pushes things along with a nod to Tony Williams. This is pianist George Cables first recording date with Freddie Hubbard but unfortunately he is confined to the dreaded Fender Rhodes which thank goodness at last seems to have now been confined to other types of music. Although Freddie Hubbard plays well enough but not in his better known style there is nothing of the old hard bop feel which listeners have become used. The second album on the first CD “Polar AC” has Freddie Hubbard playing arrangements by Don Sebesky and with a larger group including strings. These are much livelier tracks and Hubert Laws flute solos make for a contrast to Hubbard’s trumpet but George Benson’s guitar adds little to the music. “Son of Sky Dive” is more of a conventional group and as well of the presence of Hubert Laws the tenor of Junior Cook is added and solos at length. The whole of the second CD is taken up with the album “Skagly” and has much more variety which creates more interest for the listener. Michel LeGrand’s “The Summer Knows” is a straight ahead reading of the tune and Freddie Hubbard’s skills are very much in evidence and Billy Child’s piano solo is in keeping with mood. Freddie Hubbard’s composition “Happiness is Now” is a very pleasant tune and the group makes the most of it. The title tune “Skagly” is far too long and by the end you can become thoroughly bored with it’s insistent rhythms. If you enjoy Seventies music this may be your bag but it does little to further the cause of the music nor does consolidate what has gone before.